​If you struggle to maintain your yard, like thousands of people worldwide, then it might be time to reconsider your choice of mower. Self propelled mowers have been shown to be more user friendly and provide less strain than their competitors. Here we will be breaking down the best self propelled lawn mower under three hundred dollars. What is a self propelled gas lawn mower and who is it for? Our top pick for the best self propelled lawn mower under 300 is the Cub Cadet SC300. In terms of price, specifications, and capabilities we believe it is the best option for the average consumer. The mower has a sure start guarantee, triple cut blade, and full speed drive control. ​This mower provides a sure start guarantee that states any mower by this company will start in one to two pulls of the cord for three years after purchase. If not the manufacturer will cover the costs. The Cub Cadet has a triple cut blade that turns leftovers into mulch. This is good for keeping your yard from clumping. It features a dome deck design that creates optimal airflow for the blade system. The mower contains a dust blocking bag to catch clippings. It’s adjustable in height so the user can set the mower to a comfortable position for them and their needs. Another feature is the full speed drive control system that provides the user with the ability to change the speed. The mower offers easy maneuverability to allow for better steering and control for users. The product has a three year limited residential warranty. It is covered by the manufacturer and allows for more ease of mind when making your purchase. Includes a deck wash feature that you can connect to a garden hose after mowing in order to clean off the underside of the mower deck. It works well in damp grass so it doesn’t necessarily have to be nice out for you to use the mower. A well liked feature of the mower is its compact size. This allows for the mower to take up less storage space and be more easily maneuverable. It makes movement less difficult for the user. It requires minimal assembly with the mower usually being, for the main part, ready to go. The only thing the user has to attach is the handle using two bolts. The mower features three cutting system disposing options with a side discharge: a standard on most mowers, a mulching function that helps keep the grass from clumping, and a rear sack to catch your clippings. It’s considered an ideal mower for yards ½ to 1 acre. The rear wheel drive makes it work better on rugged/rough land. This is ideal for anyone with a less than flat yard. It’s good for varied settings. According to many users, it is both lightweight and durable. This is a great feature because it helps with movement and extended use. It cleanly and smoothly cuts the grass with its sharp and precise blades. The self propelling feature is superior and manages to keep a steady pace. It allows for the user to simply walk behind and guide the mower in the right direction. The Lawn Boy mower features a variable speed feature that allows for the user to change the mowers pace to suit their needs. It has all wheel drive which gives it superior traction It’s great for damp grass, hills, and rough terrain. This mower has a good size gas tank that allows for less time spent having to change it. It’s a great feature for anyone too busy to constantly have to worry about changing the gas all the time. 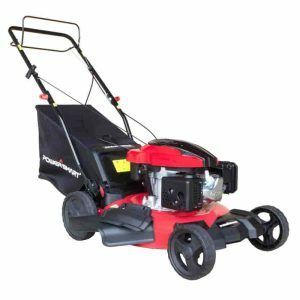 Along with its many other features, it has a lot of power that allows it to cut right through tall grass and weeds with ease. The tri-cut cutting system provides the ability to mulch and more easily cut the grass into fine clippings. Another great feature of the mower is its eight inch wheels which allow for more maneuverability when mowing and better traction. The 2 point cut height feature allows the user to change the cutting height with no hassle. Changing the cutting height can help you set how high you want your grass to be and prevent you from cutting it too short. A feature often overlooked is, the dome deck on this mower is lightweight but durable. It provides the user with less strain while also keeping the mower in shape longer. A feature unique to Remington is its Sure Cut blade system. This is their own system that ensures no clumps when discharging grass and clippings leaving your yard with a smooth finish. The mower requires minimal effort and guidance from the part of the operator. It is easy to steer and keep going. It has a powerful engine that moves with little to no interruption. It features a dual lever to change the height to your desired specifications. It has a wide range of height options, six in total, that work best for all kinds of different users. Another feature this mower possesses is the auto choke engine which many find easier to start than ones without it or of a different kind. The mulcher plug on the mower is already in place and it comes equipped with multiple different ways to discharge clippings from mulching to side discharge each with their own sets of advantages and disadvantages. This mower offers a two year warranty from the manufacturer. The warranty provides a cushion to fall back on and reassurance to the customer. The 3-in-1 Disposing design includes side discharge, mulching, and bag collecting. These provide the user with a variety of options when it comes to how they want to discharge the grass and clippings. One of the features on this mower is the variable speed which allows the operator to change the speed of the self propelled mower. The handles are adjustable to suit your needs and have a comfort grip for maximum enjoyment. This mower sells at an average price point that won’t blow your budget. It provides reasonable performance at a lower price. The sure cut blade system unique to Remington prevents clumping of grass and clippings. It features rear wheel drive which some like for its simple one direction usage and the comfort it provides. The auto choke engine makes starting the mower an uncomplicated task that many users enjoy more than competitive methods. Another feature of the mower is the gas run engine that many customers find more convenient for a number of reasons to an electric start. The classic design of the mower is simple yet effective in getting the job done. It is a sleek look that suits almost anyone’s needs. ​An estimated 62% of the 8.5 billion dollars spent on lawn care went to the purchase of mowers. Because of this staggering number, it stands to reason that many buyers are in the market to purchase a new mower. But they don’t always know what will work best for them. If your yard is too big for an electric mower and too small for a riding mower than a self propelled mower is a viable solution. It can also be an option for those who want an easier to use and control push mower. An excellent power tool that any homeowner with a medium sized yard should have. The self propelled mower is perfect for anyone trying to maintain their yard toghter with a lightweight electric hedge trimmer. People often point to this type of mower for medium sized yards, but it’s really good for any size depending on your preferences. It allows for less strain to the users body than an average push mower. Self propelled mowers operate with a recoil or electric/key start. Once you have the mower running all you need to do is press and hold down the bail arm to cause the mower to move forward or self propel. The operator is just needed to guide the mower in the appropriate direction and monitor its movements. Every mower model is different in some way. They are designed to “improve” upon the base design and for the manufacturer to put their signature on an existing concept. Cutting Heights: Mower cutting height is one of those small details that really make a difference in how your mower will do its job. The broader the range of cutting heights, the more options you have. You want to make sure that you know what type of grass is in your yard and correspond your cutting height with that. Engine Power: Engine power in walking mowers are an important part of how your mower works. Mowers of this kind generally range from 140cc to 160cc. If you’re someone who plans on using your mower for more difficult aspects of the intended job, than an engine with more power is right for you. The more powerful the engine the better your mower will do in tough situations like mowing tall or wet grass. Quality is also something to keep in mind when buying your new mower. You want to be sure the mower you buy, while still maintaining a reasonable price, is made of durable materials that will last. Terrain Adaption. Another key part in any purchase of a lawn mower is that the mower is suitable for the terrain you will be mowing. Some are better suited for a hill landscape while others mainly work on flat ground. Keep in mind how you will be using this mower and take it into consideration when making your buy. Recoil vs. Electric Start - A recoil start requires the user to pull on a cord to get the engine going. An electric start usually relies on a button or key to start. Both have their advantages and disadvantages. A recoil start is considered to be more reliable by many mower owners while an electric start is considered to have more ease than its counterpart. Set vs. Adjustable Speed - A set speed provides a stable and rhythmic pace. An adjustable speed lets you vary your speed for the optimal mowing experience. A self propelled mower allows the user to get the work done in their yard with less time and hassle. It’s often times more productive with less effort than its counterparts which aren’t self propelled. It is considered the ideal choice for medium sized yards but it can also work for any kind of landscape and yard size. Approximately 80,000+ people are seriously injured by lawn mowers each year. ​These injuries are usually preventable by taking simple steps to ensure the users own safety. Be sure to keep all parts intact for functionality. Something like the blade cover coming off can cause serious damage to the operator and those around them. Don’t stick your limbs inside the mower for any reason. This can cause injuries like deep lashes and even the loss of limbs. Often the cause of these injuries is someone trying to clean out their mower or blades. Do not attempt this. If necessary use an extender like a stick or something similar to keep your body parts out of reach of the sharp edges. Make sure the person operating the mower meets the proper requirements. It is recommended that nobody under the age of twelve operate a lawn mower. Be careful when allowing children near the the use of the mower. Don’t mow when your yard is wet. Mowing wet grass can easily cause the operator to slip and get hurt. Aside from the potential safety issues it will also cause your grass to clump up. Also, it's better to mow before rain arrives and transforms dry leaves, especially after summer, into a soaked mat. In general, mowers won't chop wet leaves properly, and they may clog rakes and leaf vacuums so it´s better to blow wet leaves before mowing. Care and maintenance are important parts of lawn mower ownership. In order to ensure your mower stays in good condition you need to take care of it. Be sure to sharpen the blade regularly, change the gas when needed, clean off/out the mower, and change the air filter. Sharpen the blades to allow for a cleaner cut when mowing. Change the gas to keep the engine functional and working. Safely clean your mower, inside and out. Change the air filter to keep your engine running smoothly. Everyone wants to make the most of the products they are purchasing. If you’ve just bought a new self propelled mower than you need to know how to use it properly. Read the manual. Reading the manual may seem like a monotonous task but it allows for you to better understand the more intricate features of your new mower. Every mower is different in some way so be sure you understand the differences and what they mean. Clean the air filter. A clean filter is better for your mower engine and decreases stress on it. Check and change the oil. As any mechanic will tell you, checking the oil is an important step to taking care of any machine. Most motors in mowers need their oil changed every 20-50 hours of operation. A: a self propelled mower is a mower that moves itself. It “propels” itself forward without the operator having to exert themselves. The operators main task is to guide the mower in the direction it needs to go. A self propelled mower reduces stress on the owners body. It also provides an effortless way for the user to do yard work. A: Self propelled mowers work via a control lever that engages the mowers movement. The mower can then be guided in whatever direction the operator desires. If your mower has a recoil start you will need to pull a cord to get it turned on. On the other hand, if your mower is an electric start than it will generally have a button to press or a key slot. A: Some self propelled mowers are rear wheel drive while others are front wheel drive. You might not know the distinction between the two though. Front Wheel mowers pull from the front two wheels. Rear wheel drive is pushing from the back. Front wheel drive mowers are better for flat yards while rear wheel drivers are better for uneven surfaces like hills. A: To adjust a self propelled mower you will need to turn a knob located below the handle. Turn the knob and this will allow you to change the traction by moving the cord up or down depending on your needs. Then put the knob back to its original position. A: Turn the mower completely off and be sure to unplug the spark plug and drain any oil in the tank. Tilt the mower onto its side and take off the screw holding the belt cover. Remove the belt cover to reveal the belt. Adjust it to your desired specifications. Follow these steps in reverse to assemble the mower and belt cover again. A: Using a self propelled mower can be an easy thing once you understand the basics. Here are a few basic steps to follow to start using your new mower. First make sure there is gas in the tank so the engine can run properly. Next place your mower on the ground where you would like to start mowing. Then turn on the mower, whether by electric or recoil start. After starting it, press and hold down the control lever that engages the forward “propelling” movement. Finally allow the mower to progress forward and guide it from there. A: To adjust a toro self propelled mower you will need to turn a knob located on the side of the grip bar. Turning the knob counter clockwise will increase or decrease the response and change the traction. After turning the knob, pull the cable up or down to increase or decrease traction. Then tighten the knob again to keep the position set. A: There are a number of differences between riding mowers and self propelled mowers. The differences have there own set of pros and cons and provide the user with a different experience. While Riding mowers require more storage, they work better for larger yards. On the other hand, self propelled mowers use less gas. They are also a less expensive option. A: a self propelled lawn mower can be a good investment to suit anyone’s needs. They are a solid choice for yard work and provide an easier way of accomplishing tasks. The main characteristic of these mowers is their ability to “self propel” meaning they will move forward on their own once started. The owner will still need to steer the equipment but the lack of having to push the mower forward provides less strain on the user’s body. It also is seen as a quicker and more convenient method of yard work than the average push mower. A: In order to turn a self propelled mower, angle it back and swivel it into the direction you would like to go. It allows the mower to change directions easier and create neater lines. Some different turn techniques include a Y turn and a 90 degree turn. Each different kind will provide a different style with its own benefits and disadvantages. A: Yes you can push a self propelled lawn mower. It will not cause any damage to the mower. Some models have a “neutral” drive option which makes for the easier pushing of the mower when it’s running. Pushing the mower when it is off is also fine to do. A: Yes you can pull a self propelled lawn mower backwards. Most self propelled mowers have a drive bar that starts the self propelling. In order to pull your mower backwards you will need to let go of the bar. This motion will not cut the engine but rather just the self propelling feature. This is a common feature in models like Toro. A: Operating a self propelled mower doesn’t have to be hard. It can, in fact, be easy enough given the right guidance and understanding. Self propelled lawn mowers generally have an electric or recoil start. This means that you will either need to pull a cord or press a button or insert a key to start the mower. After that, most self propelled mowers have a bail arm that you will need to press and hold to engage the self propelling feature. Then all you have to do is steer it in the right directions and monitor the machine. A: A precaution to take before getting into the actual replacing of the drive belt is to take out the spark plug, that ensures the mower is off and will not start while you’re working on your project. Tilt the mower onto its side to expose the underside. Take off the cover over the belt to reveal the area you will be working in. Loosen the drive belt to allow the pressure off the belt itself. The last step is to replace the old belt with the new one then go through these steps in reverse to reassemble your mower. A: Mowers often times have either an electric or recoil start. A recoil start requires the user to pull a cord while an electric start usually uses a button or key. An electric start is seen as an easier way to start a mower whereas a recoil start is seen as a more powerful option. After you’ve started your mower, all you should need to do to engage the self propelling feature is press and hold down the bail arm. A: Self propelled mowers and push mowers have a number of variations between them. Self propelled mowers exhibit less strain on the operators body, go faster than a push mower with less manual labor, and have a better engine. Push mowers, though, are less expensive than their self propelling counterparts. 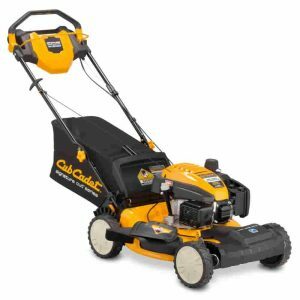 Our top pick for the best self propelled lawn mower under 300 is the Cub Cadet SC300. In terms of price, specifications, and capabilities we believe it is the best option for the average consumer. The mower has a sure start guarantee, triple cut blade, and full speed drive control. This mower takes the difficulty out of mowing and provides you with an easier experience in your yard work. Compared to the other mowers on this list, it manages to set itself apart with its dynamic design and simple to use structure. 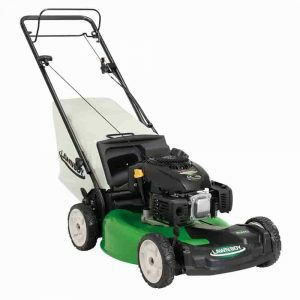 It provides a more affordable, yet still great quality, purchase than many of the other mowers including the Lawn Boy 21 inch self propelled mower, which sells for a higher price point. Also, the best cheap self propelled lawn mower Power Smart offers a great value for the money. This mower outweighs the competition, in the same range of price, in performance and ease with which it does its job.